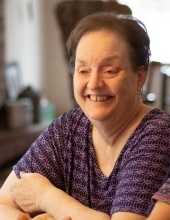 Janet Flory Flaten, 65, of Bridgewater, VA, passed away Thursday, April 11, 2019 at Sentara RMH Medical Center. She was born in Bulsar, India on November 26,1953, and was a daughter of the late Wendell and Marie (Mason) Flory. Janet was a member of Bridgewater Church of the Brethren. Janet earned her first bachelor's degree in Music from Bridgewater College, class of 1976. She then taught music at Hillcrest School in Jos, Nigeria, where she met Dale Flaten. Janet and Dale married on July 12, 1980 and returned to the USA to start a family in 1982. Janet started work at Bridgewater Home as a CNA in 1994. She then returned to school and earned a second bachelor's degree, this time in Nursing from James Madison University, class of 2000. She transitioned into an RN role and continued her work at Bridgewater Home until she retired in 2018. Janet is survived by her husband Dale, her two children, Leroy Flaten and wife Allison in Norfolk, and Sharon Flaten in Jos, Nigeria; two brothers, Theodore Flory and wife Mary Beth, and Philip Flory and wife Ellie, all of Bridgewater. She was preceded in death by a sister, Mary Jo Flory-Steury. A memorial service celebrating Janet's life will be held at Bridgewater Church of the Brethren on Saturday May 11, 2019 at 11 AM with Pastor Jeffery Carr officiating, followed by a time of fellowship in the Social Hall. Memorial contributions may be made to Church of the Brethren, Global Mission and Service, 1451 Dundee Avenue, Elgin, IL 60120 www.brethren.org/givegms. To send flowers or a remembrance gift to the family of Janet Flory Flaten, please visit our Tribute Store. Guaranteed delivery before Janet's memorial service begins. "Email Address" would like to share the life celebration of Janet Flory Flaten. Click on the "link" to go to share a favorite memory or leave a condolence message for the family.